On Thanksgiving almost ten years ago when my sister was a newlywed, she volunteered to bring the Pecan Pie to her in-laws holiday dinner. With a propensity for running behind schedule and still figuring out how to juggle two families for the holiday; she prepared the pies from scratch but ran out of time to bake them before she had leave for my family's house for lunch. She decided that she would bake the pies in my mom's oven as we all enjoyed lunch. They would be ready in time before she had to make her way to her second destination and none of her in laws would know about her scheduling snafu. As we sat down to eat she put the pies in the oven, set the timer and then headed into her first tryptophan overdose of the day. Exactly 45 minutes later the timer went off just in time to allow for the 15 minute cooling period and then off to the in laws. As she opened the oven door she realized she had made a terrible mistake. She had put the pies in and set the timer, but had neglected to turn the oven on. Her pies had sat in the oven for 45 minutes unaltered. We were all too engrossed in the happenings of the Thanksgiving feast to notice that there were no baking smells escaping from the kitchen.With no other options left, she had to arrive at her first in-law holiday dinner with a pre-made supermarket pie. Heat oven to 350°F. Combine all cookie ingredients except flour and baking powder in large bowl. Beat at medium speed until creamy. Reduce speed to low; add flour and baking powder. Beat until well mixed. Shape dough into 1 1/4-inch balls. Place 2 inches apart onto ungreased cookie sheets. fill each cookie with 1 rounded teaspoon filling. These cookies can be made ahead and stored in the freezer up to 3 months. Place cookies in containers with tight-fitting lids, separating layers with waxed paper. Oooh how tasty! I love pecan pie but can only stand about two bites of a whole slice. This will be a great alternative! These look really tasty! Love the no bake story - I usually have the opposite problem and burn something (especially when using the broiler!)! Now that's my kind of cookie! 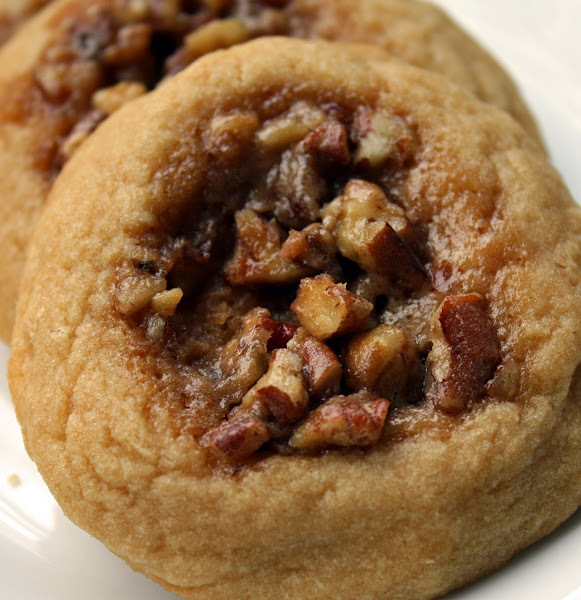 Cookies with a pecan pie filling are a great idea! Oh your poor sister! ...best laid plans Of Mice and Men. These cookies look down right mouth watering. I just may have to send my DH the recipe. Those cookies look so delicious. I am definitely bookmarking this recipe, thanks! How frustrating for your sister after going to all of the work for perfect pies! These cookies look awesome. I love that they have filling like tiny lil' pecan pies. Yum! These look delish. Definitely on my to try list now! on the land o lakes site people had problems with the cookie spreading too much... did you have this problem? if so, what did you do to fix it? I didn't have an issue with spreading. I tried not to indent the cookies too much with my thumb and then ones that I got over zealous with I built the walls up a bit around the indention. Oh man!! Those look good!! Mmmm. My parents own and live on a pecan orchard (grove? whatever you call it) and we're always looking for new ways to use them. They're so delish, and these cookies look like a great use for them! These taste amazing! I made them for thanksgiving dessert, BUT instead of baking powder I would recommend substituting baking SODA because they didn't rise properly, they just melted. Also consider refrigerating the dough before scooping it and making the indent. Flavor is great, just a few mechanical problems.